We’re in the double-digits – less than 90 days until Halloween! 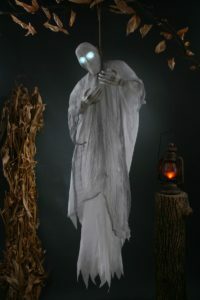 Here are some of this year’s best Halloween decorations and prop tips for the upcoming Fall season. Beware! Here’s what we’re up to in preparation for Halloween 2017. Before we think about ourselves, we’ve begun thinking about our homes. As Halloween mega-fans, our neighbours expect big things from how we decorate our yards so we need to start planning now! Yes, John across the road may give you an odd look as you hang up your 60 inch Strangling Ghost decoration in August and yes, your local grocery store may refuse to order pumpkins for you to begin carving practice but that won’t stop us! We know that when it comes to the week before Halloween, all this practice will make for a perfectly terrifying front yard Halloween display. While all of that is going on, we are frantically trying to finish re-reading Stephen King’s IT so our memories are refreshed and ready for the new IT movie release September 8. 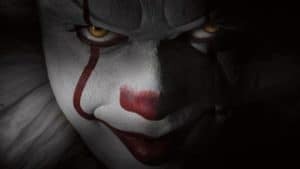 Pennywise is sure to be a big hit this Halloween so we want to remind ourselves of his disturbing facial expressions so we can replicate them on October 31st. On the topic of facial expressions, an expression is nothing if not accompanied by some pro-looking makeup. We have less than 90 days to help you become expert Halloween makeup appliers. Fake blood can be bloody difficult to make look real. Nobody will be impressed if you turn up to a party with what looks like ketchup dripping down your face. If you find, you are struggling to perfect your scary makeup skills keep an eye out for a makeup demonstration event at your nearest Halloween Alley store. Finally, and most importantly, we will be trying on our Halloween costumes, planning events and setting up our Halloween stores for this October 31. Our team member, Skully, is on his way to recover our list of stores from the fabled Iron Safe. We’ll probably hear back from him in August, so stay tuned. Take note, Canada – we’re on our way!